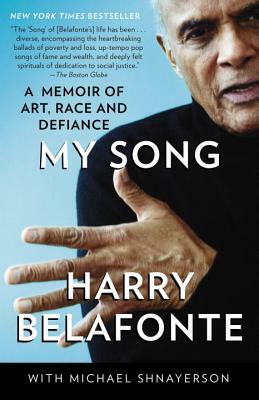 An eloquently told personal account of an era of enormous cultural and political change, which reveals Harry Belafonte as not only one of America’s greatest entertainers, but also one of our most profoundly influential activists. Harry Belafonte spent his childhood in both Harlem and Jamaica, where the toughness of the city and the resilient spirit of the Caribbean lifestyle instilled in him a tenacity to face the hurdles of life head-on and channel his anger into positive, life-affirming actions. He returned to New York City after serving in the Navy in World War II, and found his calling in the theater, before transitioning into a career as a singer and Hollywood leading man. During the 1960s civil rights movement, Belafonte became close friends with Martin Luther King, Jr., and used his celebrity as a platform for his activism in civil rights and countless other political and social causes. My Song tells the inspiring story of a startlingly original and powerful entertainer who has always engaged fiercely with the issues of his day. Harry Belafonte’s 1956 album Calypso made him the first artist in history to sell more than one million LPs. He has won both a Tony Award and an Emmy, and he was awarded the National Medal of Arts by President Clinton. He has served as a UNICEF Goodwill Ambassador and is the recipient of Kennedy Center Honors for excellence in the performing arts. He currently resides in New York City with his wife, Pamela. Michael Shnayerson, a longtime contributing editor to Vanity Fair, is the author of Irwin Shaw; The Car That Could; The Killers Within, coauthored with Mark J. Plotkin, and Coal River, which recounted the efforts of Appalachian lawyers and grassroots groups to stop the devastating practice of mountaintop coal removal in southern West Virginia. Shnayerson’s passion for those environmental activists was one reason Harry Belafonte chose him to collaborate on his autobiography. Shnayerson lives in Bridgehampton, New York, with his daughter, Jenna.